The Makita XBP02Z 18V Portable Band Saw is a killer saw in every sense of the term. As far as I can see, this machine doesn't fail to impress because of its wide range of variable speed. It has six settings instead of the usual two, which allows me to cut a wider variety of objects while keeping its battery from being drained too quickly. It's because I can go down several settings to easily cut various softer materials and only dial up the tool to its highest setting when required. The motor doesn't even slow down or stall when cutting through plate steel that's ¼-inch thick. This is because Makita uses razor sharp stock blades that are as hard as coffin nails, so it can go through various materials without ending up dulled for a long time. Its 6-setting variable speed control dial that superior to its competition's one-speed or two-speed capabilities. Its ability to cut faster with a motor that can go 275 to 530 feet per minute. That it weighs only about 15 pounds so that your arm won't get tired of holding it for a long period of time. Noisiness in the form of a putting or chuck sound. I've "Been there," and "Done that," when it comes to band saws as a researcher and user of power tools. It takes something extra special to elicit my attention as far as saws are concerned. What I'm specifically searching for when it comes to band saws is consistency and persistence. It's not enough that a band saw has the highest possible specs when it comes to cutting or cut capacity and a high speed output from a motor that won't quit. It should have other special features as well to temper that strength and raw energy into something usable. As such, it all boils down to a tug-of-war between band saw mobility and power, with other extras on the side to make life easier for a construction worker, homeowner doing home improvement, woodworker, lumberjack, and even butchers who have to cut meat out of animal carcasses. The band saws I favor also tend to have great ergonomic designs with special shells or bumpers that add to their durability. I want a well-built tool that can stand the test of time yet is also safe enough to allow non-professional users to make use of it as well without hurting themselves. Workers who cut down industrial pallet racking, conduit, or long rails on the roof should get a lot out of the Makita XBP02Z 18V Portable Band Saw. You can add timer cutters, metal fabricators, homeowners doing DIY home improvement, woodworkers, and butchers into the mix as well, but the majority of reviewers for the Makita XBP02Z are mostly construction or industrial worker types. I myself have done construction work for metal fabricators. It's therefore my humble opinion that this Makita XBP02Z 18V Portable Band Saw is a worthwhile buy. Out of all the band saws I've used, Makita is one of the few that offers a good balance between power and mobility, like a sports car having superior mobility to a tank or a sports utility vehicle on the road although both can probably outdo them in terms of raw power. The weight isn't as objectionable as certain other reviewers of the XBP02Z claim. In fact, it scores points high points with factory maintenance and timber workers for the fact that for a full-sized band saw, it only weighs about 15 pounds. It's a professional's choice because it's light enough to not tire your arm out after extended use. Here are the different benefits the Makita XBP02Z should offer to different industries. It's a full-sized band saw that has six-setting variable speed control to match the specific speed of different applications such as cutting plastic, wood, or metal in residential garage or basement workshops and any light industry factory. Its general purpose blade can deal with both wood and metal as needed, although you can swap it out for something more optimized to your work. The Makita XBP02Z 18V Portable Band Saw has the control, speed, durability, and comfort needed to deal with dedicated metal cutting, as evidenced by the vast majority of reviewers of the Makita being metal workers for structural steel fabrication shops or bar stock cutters in machine shops. You'll specifically need a stainless steel construction saw (with fine teeth, heated tips, plain knife edges, or scalloped knife edges) and easy-to-clean design from the Makita XBP02Z 18V Portable Band Saw in order to make it viable for cutting meats. Band saws are good for butchery because they can cut through the bone and they're sharp enough to slice through tissue cleanly. Lumberjacks and woodworkers make use of both portable full-sized band saws like XBP02Z and vertical stationary saws mounted on tables. Sure, a chain saw has more cutting power pound-for-pound, but a band saw cuts cleaner and can handle fine-tuning work without tiring your arms out. Before purchasing the Makita XBP02Z 18V Portable Band Saw or its competitors, take the following into consideration first. Commercial or residential band saws are typically available as a vertical type of saw mounted on a cabinet stand, bench, or table. 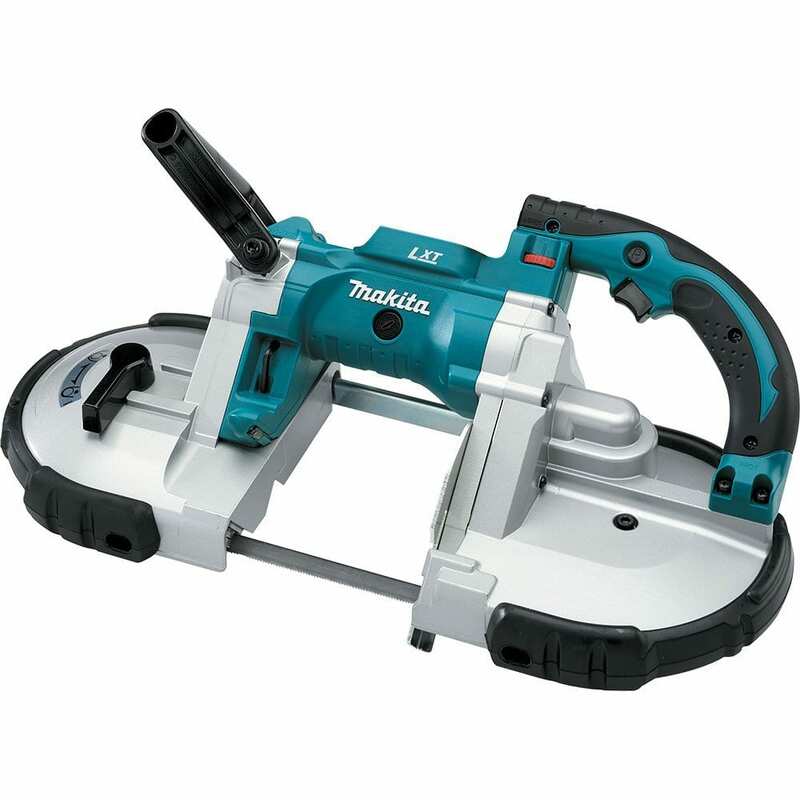 The Makita XBP02Z and others like it are more portable because they're the power tool version of the band saw. This is a cordless model that allows building contractors to bring them to a jobsite with no electricity yet. You should definitely be aware of what you're going to use your Makita XBP02Z band saw for. Is it for residential home improvement work or light industry? How about metal fabrication? Construction work? Butchery? Woodworking? Timer cutting? You may need additional alterations to your saw for some of those industries (like saws optimized for metal cutting or stainless steel saws for meat cutting). When you get a specialist band saw, you typically have the best saw available for whatever work you're doing with the trade-off of not being able to use it for other work. Meanwhile, a versatile option like the Makita XBP02Z 18V Portable Band Saw allows you to do work in more applications at the cost of having a saw that's not necessarily the best one in any given line of work. The Makita XBP02Z 18V Portable Band Saw is a six-setting variable speed control band saw that weighs about 15 pounds (or 14.3 pounds without the battery) capable of cutting a burr-free cut for most materials in 10 seconds flat. The cut-off wheel doesn't produce sparks and there's no heat from a torch either. With that in mind, here are the features and benefits of the Makita XBP02Z 18V Portable Band Saw you should watch out for. The speed and power of the Makita XBP02Z wouldn't matter as much had it not a coffin-nail-hard stock blade with amazing sharpness that can withstand the test of time and continuous everyday usage. The weird sound coming from the welded section of the band saw notwithstanding, it's a stable blade that does clean cuts. Its high cut capacity can also be thanked for its large amount of gearing. Although it's noisy because of this, you can get the smoothest of cuts from this device. It owes this from its fast cutting rate of 275-530 feet/minute. It's no exaggeration that this power tool can cut through most anything like a hot knife through butter. Once you do have to change the blade after it's been worn down or if you're in need of special blades for cutting meat, bone, metal and wood, then you can do so with the assurance that it's quite easy. The Makita XBP02Z also features a protective bumper design to ensure longevity and durability as well as the ability to look straight down on the blade to guide its cut. While it doesn't include the battery and charger, the tool itself comes complete with a tool bag that holds and protects the band saw nicely. The machine's 6-setting variable speed dial allows you more control over it and opens you up to energy-efficient and versatile cutting. The Makita-built motor of this band saw is capable of going 275 feet per minute all the way to 530 feet per minute. It's also quite durable thanks to its protective bumper design. It weighs only 15 pounds and uses a battery so that your arm won't end up fatigued after extended use. Because it's a baretool, you only have to pay for the tool itself (charger and battery sold separately). Heavier than the lighter band saws out there. Makes an obnoxious noise that thankfully doesn't alter the cut. Safety lock can permanently keep the machine on until unlocked. The reviews for the Makita XBP02Z 18V Portable Band Saw are filled with praise from the reviews. Then again, it doesn't quite reach the 5.0 star rating because of a few detriments like complaints about it being heavy and the loud noises it makes when you run it (it's not quite like a chainsaw in terms of loudness, but there are quieter band saws available out there). In contrast, other Makita XBP02Z reviewers like it for having a low weight relative to a Milwaukee or DEWALT band saw. However, some reviewers tend to complain about the machine's safety switch that can lock the trigger. While normally this is an awesome safety feature of sorts that keeps you from accidentally or unintentionally triggering the lock, the XBP02Z has a quirk wherein you can lock the trigger on and off, which mean you can turn the saw permanently on if you're not careful. Just avoid doing some tomfoolery with the handle. It's also recommended that you observe safety guidelines when using portable band saws or any saw of its type. Other than that, the reviews are a love fest in regards to the excellence of the saw, particularly its ability to cut pipie in five seconds and ½ to ⅜ flex with no tin snips afterwards. Here are the closest rivals that the Makita XBP02Z band saw has. The XBP02Z has the cut capacity of 4¾ inches and the DCS374B instead has 5 inches. The DEWALT band saw is a little larger at 24.4 x 13 x 8.3 inches compared to the Makita band saw's 14 x 23 x 11 inches in dimension. They're close to each other even in price, with the Makita XBP02Z costing $319 to the DEWALT DCS374B's $316. Here's another excellent DEWALT offering, with this one serving as the lighter and less cut proficient version of the DEWALT DCS374B. The DEWALT DCS371B is inferior to the latest model with its 2½ inches cut capacity and 10.2 pounds of weight. It therefore compares the same way to the Makita XBP02Z band saw in light of how similar its specs are to the DEWALT DCS374B. The DEWALT DCS371B has traded off cut capacity for superior mobility and smallness at 15.38 x 12.2 x 8.7 inches (which actually is close to the dimensions of the XBP02Z, only this time the Makita band saw is heavier). As for the SKIL 3386-01, it's a heavy hitter of a full-sized saw that trades off size and mobility for the sake getting extra inches in cut capacity and overall power. It's bulky compared to the likes of the DEWALT DCS374B and the Makita XBP02Z at 31.1 x 16.2 x 12.8 inches. All the same, it provides straight and accurate cuts with its raw power and its 1½-inch dust port ensures that dust won't end up ruining it down the line since cleanup it's a breeze. However, it's important to note that for all the bulkiness of the SKIL 3386-01, it only has 3½ cut capacity (or a 1¼ inch advantage) compared to the 4¾ cut capacity of the significantly more compact XBP02Z. As for the Bosch Bare-Tool BSH180BL, it's about the same size as either the DEWALT DCS374B or the Makita XBP02Z at 16 pounds and 17.5 x 14 x 6.2 inches (give or take an inch and a pound). However, for something so similar in build, it only delivers 2½ inches of cut capacity that's comparable to what the DEWALT DCS371B offers minus about 6 pounds of weight. It's still 60% lighter and 40% more compact than many other deep cut saws (such as the SKIL 3386-01 Band Saw and definitely the WEN 3962 Two-Speed Band Saw). It's just that in the same class of lightweight full-sized saws, the Makita XBP02Z and the DEWALT DCS374B definitely outdoes it in performance for a saw its size. Easily the heaviest saw of the bunch at 73 pounds, the WEN 3962 Two-Speed Band Saw with Stand is a non-portable type of band saw that delivers quite a bit in terms of cut capacity and stability. It was included in the bunch so that you, the buyer could compare a stationary band saw to the non-stationary ones here. While the DEWALT DCS374B and the Makita XBP02Z are close to the huge WEN band saw in terms of cut capacity, they don't compare to it as much in terms of stability. Your cuts are limited but they're assured to be clean because human error is eliminated. Also, even though the Makita unit has six speed settings, the 1,520 to 2,620 RPM of the WEN 3962 is far more impactful. Yes, there are other band saws out there that are lighter and/or have more cut capacity than this unit. However, when compared to one of Makita's finest band saws individually, you can easily see that each band saw has one or two features that Makita improves upon slightly or greatly. This is because the Makita XBP02Z 18V Portable Band Saw is a jack-of-all-trades kind of full-sized saw with few to no obvious weaknesses. It doesn't overly excel in any particular feature but as a whole it beats out other band saws thanks to its excellence across the board. Yes, sure, I wouldn't want to do overhead cutting with this 15-pound full-sized band saw, but the weight isn't as objectionable as some of the other comparable band saws out there (like the WEN 3962 Two-Speed Band Saw), and it's indeed pretty maneuverable for a big guy.